So we found out a couple of weeks ago that we are going to be having a BOY! We are so excited! I'm finally halfway through, I hit my twenty weeks today, and it was like all of a sudden that my belly popped. I'm finally starting to show... a little bit. I can't believe how fast this pregnancy is going. Taking care of Símone must be what's making it go by so quickly. One of my favorite things about being pregnant is picking out names... but for some reason picking out boys names is a lot harder than it looks. So we don't have any possible candidates yet, but hopefully soon... before He comes. We will keep you updated. 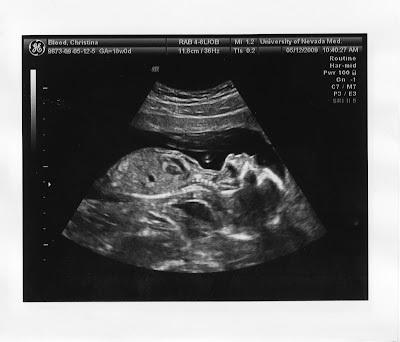 Here's a quick peek at what our little one's going to look like. 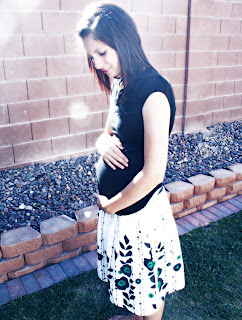 And also a picture of me and the baby at 19 weeks. Enjoy! I love this profile picture of him. I have one just like this one of Símone and it is so amazing how similar they look. It's going to be even more interesting to see what he really looks like when he arrives. And here I am at 19 weeks. Slowly, but surely... I'm growing everyday! It came and went quickly... but we celebrated Símone's first birthday last weekend. We had a total blast. Family from both mine and Kyle's side came to celebrate. Though we did miss my sister Chanele, and Kyle's brother Mathias and his family, Christy, Hunter and Haylee. As well as our nephews Noah and Weston. Other than that we had tons of fun, eating Sloppy Joe's, busting up the pinata, having fun playing water games, and a fun little scavenger hunt. Well, let's just say that the kids had most of the fun. The adults just had fun watching them. Símone did well too, she's getting to be such a big girl, she helped Daddy open the presents, and dug right into her cake, and devoured it. We are just so grateful to have such awesome family, and all the love and support they give. Thanks guys for all the gifts, and celebrating her first birthday with us. The Birthday Girl! She is so Beautiful! The family! They were such troopers enduring the heat while the kids played their games! The Birthday Girl again after getting all wet! Here's Colton... he is such a cutie, and I think he was having a blast... don't you?! The kids were supposed to use the pool of water to wet the splash bombs, and fill their water guns, but I guess they just thought it would be much easier to just hop right in! Simone's attempt a hitting her pinata, with the help of Grandma. Simone's did such a good job helping Daddy open presents too. She loves that doll that Grandma Dixie and Grandpa gave her. She is going to be the best Mommy when she grow up! And here she is devouring her cake... Yummy!